Spring 2011: When Can the Sanctuary Close? The great message of Hebrews 10 is that Jesus, in the sanctuary of the new covenant, accomplishes that which the typical services could never do through the offering of bulls and goats. For the law [that is, the Levitical law of the tabernacle] having a shadow of good things to come, and not the very image of the things, can never with those sacrifices which they offered year by year continually make the comers thereunto perfect (Hebrews 10:1). “Then would they not have ceased to be offered? Because that the worshippers once purged should have had no more conscience of sins” (verse 2). If the animal sacrifices had accomplished the work of thoroughly purging the worshippers from all iniquity, the sanctuary service would have ceased. Now suppose it were possible to teach people how to drive so that they wouldn’t have accidents and how to live so that they wouldn’t get sick. What would they do with that hospital? They would close it. Why? Lack of business! Well, I bring you good news. The sanctuary in heaven will soon close for lack of business! And if you say this is impossible, remember that “the things which are impossible with men are possible with God” (Luke 18:27). The weakness of the ancient service was that “it...[was] not possible that the blood of bulls and of goats should take away sins” (Hebrews 10:4). If sin is such a trivial thing that the blood of an animal could take it away, then the Son of God need never have left His throne and come to Bethlehem, to Nazareth, and to the cross. But He had to come! He solved the problem of sin by dying on Calvary and then, still bearing our humanity, by ascending to the sanctuary above to plead His blood for the forgiveness of sins in the holy place. Finally at the end of the prophetic days we see Him go within the second veil to sprinkle His blood on the mercy seat in full and final atonement so that He may blot out sins forever. And when that work is finished, Jesus will come to take His people home. God did not desire the continuance of sacrificial offerings. Instead He desired obedience to His law, and Jesus came to demonstrate this in human flesh. He said, “I delight to do thy will, O my God: yea, thy law is within my heart” (Psalm 40:8). He could truly testify, “I have kept my Father’s commandments” (John 15:10). Now the question is, can the life that Jesus lived in human flesh two thousand years ago be demonstrated in the lives of Christians today? Yes. What animal sacrifices could not do, Christ’s death and ministration will accomplish. “By one offering he hath perfected for ever them that are sanctified” (Hebrews 10:14). To support this assurance, Hebrews 10:16-17 quotes the new covenant promise,“I will put my laws into their hearts, and in their minds will I write them; and their sins and iniquities will I remember no more.” The logical conclusion follows, “Now where remission of these is, there is no more offering for sin” (Hebrews 10:18). When in the temple above the sins of God’s children have been blotted out forever, no more to be remembered or come into mind, then the sanctuary can close. Its work will have been accomplished. What does it mean to have the law written in the mind and heart? Perhaps we can think of the law written in the mind as knowing God’s will. Let me illustrate. There’s a man who all his life has ignorantly transgressed the Fourth Commandment, observing a day that the Lord never sanctified. Through God’s evangelistic sermon, through a tract or a truth-filled book, over the radio waves, or through a TV program, he comes face-to-face with the binding obligation of the Sabbath. As he studies his Bible the conviction deepens. What is happening in his mind? The law of God is being written there. The same hand that inscribed upon the tables of stone the precepts of the Decalogue traces the will of the Eternal in our minds. But this is only one of the Ten Commandments. God intends that as we continue to behold His revelation of truth we shall become better and better acquainted with the details of His will. We should make the psalmist’s prayer our own, “Open thou mine eyes, that I may behold wondrous things out of thy law” (Psalm 119:18). “Let us hear the conclusion of the whole matter; Fear God and keep his commandments: for this is the whole duty of man. For God shall bring every work into judgment” (Ecclesiastes 12:13-14). 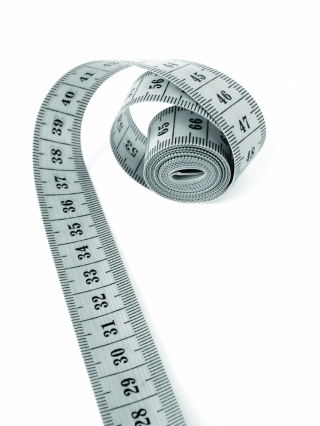 When He measures our lives in the most holy place, the measuring line is the Ten Commandment law (see James 2:10-12). God inspired the entire Bible to magnify the law and bring out its full meaning. Just as some of us need glasses in order to read common print, so in both the Old and New Testaments we have a pair of lenses designed to magnify the law that we may discover everything in our lives displeasing to God. Then we can bring those sins to the sanctuary so that God can cover them by the blood and finally blot them out. “By the law is the knowledge of sin” (Romans 3:20), and Paul says, “I had not known sin, but by the law” (Romans 7:7). If I want to discover hidden sins in my life so that I can ask Jesus to take them away, what should I study? The law. And the Bible, as a pair of glasses, helps us see wondrous things out of the law. Let us consider a few examples. In His Sermon on the Mount, Jesus commented on some of the commandments. 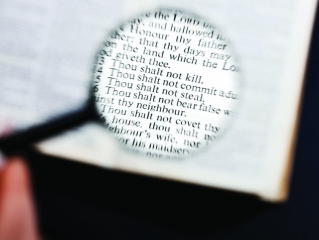 He quoted the Sixth precept, “Thou shalt not kill,” and then put the magnifying glass on it. He showed that the man who gets angry with his brother is a murderer. Notice that Jesus does not merely say that hate leads to murder. Instead He insists that whoever hates his brother is a murderer. Now you and I might not know that unless we read it in the Bible, but inspiration says it is all in the law. In the Sermon on the Mount Jesus also quoted the Seventh Commandment, “Thou shalt not commit adultery.” Then He focused the magnifying glass. “Whosoever looketh on a woman to lust after her hath committed adultery with her already in his heart” (Matthew 5:28). Now we see that the law goes beyond the outward action and reaches to the inner thoughts. Today filthy literature and impure pictures abound, but God will have a remnant who, like Enoch, walk with him. “They are without fault before the throne of God” (Revelation 14:5). The Christian will exemplify the Seventh Commandment as magnified by Jesus. Now I ask an important question. If God brings into judgment the man who looks on a woman with lustful interest, what will He do with the woman who follows the fashions designed with the express purpose of provoking lust? God will provide forgiveness if we come to the sanctuary and with weeping confess our transgressions of the Seventh Commandment. We have seen how the Bible magnifies the Sixth and Seventh Commandments. We should fall to our knees and in humility bring the magnifying glass of the Inspired Word to each precept of the Decalogue. Such study will bring rich rewards and will reveal privileges and duties we have never thought of. Shall we come to the sanctuary and by faith look in through the open door? Shall we behold the holy law shining with God’s glory? The Saviour waits to fulfill His new covenant promise. He will write His law into our minds.